Most bloggers will like to have information on their visitors. For me, I have been quite satisfied with Statcounter which had up till now, given me those statistics I want. Other reasons for using Statcounter are, it is real time, there is a choice of visible and invisible counter. Way back, I had briefly played with Google Analytics but found the amount of information a little bit overwhelming and thought I don't need all that much information and I don't have that much time to check the statistics anyway. That is, until recently. What prompted me to have a second look at Google Analytics was that link in my Google AdSense report "Integrate your AdSense with Google Analytics" (or something like that, from memory because after integrating, the link now says "Go to your Google Analytics Account". When I had the time, I did dig deeper into the Google Analytics statistics and found many reasons why you should check it out too. One of the statistics from Statcounter is the screen resolutions of visitors which when I started blogging, showed that a substantial percentage of visitor still used the small 800x600 resolution. Because of that, I had stuck to Ramani's 3 column fixed width Minima template which fits nicely into the whole width of a 800x600 screen. As time went by, the visitor statistics showed that visitors with 800x600 screen resolution have become a small minority which made me switch to a wider 4 column Minima template which width fits nicely into a 1024x768 screen. However, one thing in the Statcounter screen resolution troubled me, the relatively large number with screen UNKNOWN. 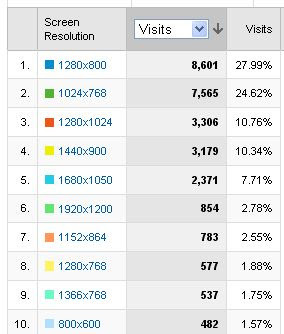 Google Analytics too have statistics for visitors screen resolution, but I discovered, much more detailed. As you can see in the screen shot above, Statcounter only gives 6 screen resolutions, one of them being UNKNOWN. Compare it with the screen shot below for Google Analytics. 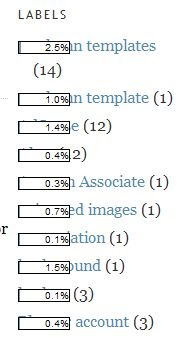 Google Analytics gives 10 screen resolutions, and there is no UNKNOWN. So Google Analytics have given me some assurance that the percentage of the 800x600 small screen is really small. I no longer have the worry that the among the large number of UNKNOWN in Statcounter statistics were hidden more small screens. There is some concern that Google Analytics may slow down site downtime. I think this is a small concern if you paste Google Analytics codes just before the </body> tag which will be practically at the bottom of the template and will be the last to load. Hi Peter! Yes, I started using Google Analytics two months ago too. I started using it after I saw the amount of information it gave (for free) to my company's website. But as you say, I found it overwhelming too and have not gone into the depths that you have. This connection with Adsense sounds really interesting. Thanks for the breakdown. Btw, have you tried using TwitterFeed.com for posting Blog posts automatically to your Twitter account? And also wanted to ask whether you use the analytics provided by the Add This add-on to every post? Twitterfeed.com? No, new posts are not that frequent in this blog. Would rather do it manually. my profile statistic is stuck to 360.there is no change in the counter even after addition of new blogs,comments and visitors. why doesnt the viewver stats increase? That is a common complaint that we can do nothing about. Let me introduce a small service which gives you just a small image of your Google Analytics visits data: sharega.com. This simple image looks like TwitterCounter badge or FeedBurner badge. Thanks for post and it’s great but right now… My Adsense account is not activated.. I don’t the reason… Well will use it in future.. Keep Sharing! !